A look at the OCPF (Office of Campaign finance) reports ending July 31, 2013 tells us that what we can assess on our own already is true: there are four tiers of candidacy among the twelve whose names will appear on the September 24, 2013 ballot. At the bottom are Charles Clemons and David Wyatt, who have raised almost no money and spent hardly any. The next tier, of candidates who have raised low six-figure money, or a bit less, includes names both expected and a surprise. It was always likely that Charles Yancey would fall far short. John Barros too. But who knew that Charlotte Golar-Richie, the only woman in the race, a former State Representative and a widely esteemed administrator, would barely make this tier’s cut ? Or that Felix Arroyo, whom many expected to see in the top tiers, would fall into this one ? Both Golar-Richie and Arroyo have raised less money than Bill Walczak, a community organizer and hospital administrator — highly regarded, and for many decades — but who has never run for any elected office. The Walczak presence intrigues us. As the only candidate openly opposing locating a casino in Boston, has won to his side all those who reject a development which would add many jobs and lots of tax revenue for the city. Whatever we may think of such opposition — and we decry it — it is the opinion of a vocal minority,and Walczak has it. His tactic is a common one for an underdog candidate to adopt. At this stage of the mayoral campaign, it makes sense for a candidate who at first glance looks overmatched to gain traction by bringing into camp at least one identifiable and committed constituency. This, Walczak has done. 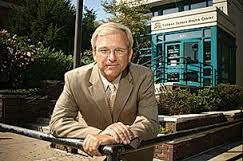 ^ Bill Walczak the anti-casino candidate : raised 4 234,919.95. More than either Arroyo or Golar-Richie. The downside of Walczak’s move is that almost everybody in the City wants to see a casino complex built here. Still, his move blocks rival candidates from poaching a following that probably totals six to eight percent of the Primary vote. Next we have the tier of strong runner-ups. Here are three names, all important in the race ; Mike Ross, a District City Councillor, who has raised $ 625,579.88, much of it from real estate interests; District City Councillor Rob Consalvo, who reports $ 445,783.29; and District Attorney Dan Conley, who has amassed $ 698,307.64, reportedly mainly from lawyers. The top tier belongs to just two names. Neither is a surprise. 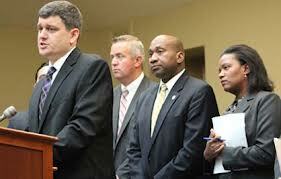 At-large City Councillor John R. Connolly has raised $ 834,242.96; State Representative Marty Walsh, $ 857,526.96. If money were the only fact in this race, the Final would contest these two, likely as close a vote as their money figures. But money isn’t everything in politics. Visibility matters just as much. By “visibility” we mean not just what you can see but what you hear and feel: the grip of a hand on your wrist, as we like to say it. Visibility on the street used to be all; today, one has to add visibility on the internet. This changes the Boston Mayor outlook significantly. The “traditional” Boston voter has given Walsh, Connolly, Conley, and Consalvo their strong money and, so far, polling advantages. The other candidates with any chance of winning, however, must work on a different route. As they must look to young voters and to technology-driven Downtowners — who are almost impossible to reach with a door-to-door campaign — social media is their means. This is how life is lived today and not just in Boston. But can social media elect a Boston Mayor ? On the street, the visibility victory goes to Consalvo, Walsh, Connolly, and Conley, in that order; and then to Arroyo. On social media, Arroyo does much better; and Ross, especially, has made himself a social site force. Presence on social media allow Arroyo and Ross to rank, at “omgreports.com,” fourth and fifth — higher than Rob Consalvo. Indeed, the site’s online voting function ranks Arroyo first. Still, even online, Walsh and Connolly place no lower than second and third; indeed “omgreports.com” ranks Walsh and Connolly the top two in overall presence, with Dan Conley third. And why not ? The “traditional” candidates have boldly put their issues agendas to voters both “traditional” and on-line — bolder by far than any of the “new Boston’ candidates has done. Connolly put his forth just yesterday, in seven languages, no less, on-line and on the street. The “traditional” candidates are not living in 1983. They all have significant, even commanding, presences in social media, on Facebook and Twitter. And so do their voters. It’s a new generation even in West Roxbury, Dorchester, and Southie. Money and visibility thus agree. 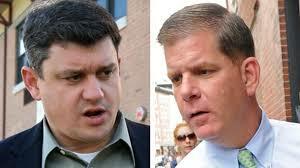 The Final two will likely be John R. Connolly and Marty Walsh. It’s not impossible for Conley, Consalvo, or even Arroyo to edge ahead of either man, but it would definitely be news. Significant upward movement had better start to show really soon for the three candidates now trailing, but with a chance. Will there be such ? We await the August finance reports — and some well-researched polling results. 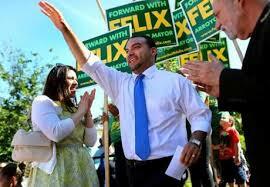 ^ Felix G. Arroyo : big street presence in many parts of the city. Is it enough ?